Richard Strauss’s devotion to the female voice as instrument is undeniable. For the last 125 years, sopranos are grateful to him for the strong and powerful heroines that he has written. He gave a musical voice to women who were already immortal in name alone such as Salome, Elektra, Ariadne, Daphne, and Helen of Troy. Who inspired this composer to write soaring and rich music to match the intensity and passion that was required for these characters to come alive? One name comes to mind… Pauline. 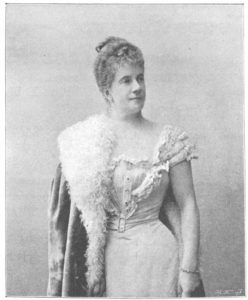 The two had a secret engagement for a period of time since she was not only a student of Strauss, but Pauline was originating the role of Freihild in Strauss’s first opera, Guntram. An anecdote from these two love bird’s courtship happened during one of the rehearsals. Pauline was distraught when Richard kept stopping the rehearsal to give the tenor, Heinrich Zeller, notes due to Zeller being unable to master the taxing vocal demands of the role. Pauline was jealous of this attention and when it came time for her aria, she stopped in the middle of the scene and asked why Strauss wasn’t correcting her. Richard replied that she knew her part well, and didn’t need to interrupt. Pauline then exclaimed, “but I want to be interrupted!”, proceeded to throw a piano score at Richard’s head (missing him completely) and then stormed off to her dressing room. Richard went off to console her, and when he returned to the rehearsal, found the orchestra waiting with bated breath to see how the Maestro would deal with this outburst. He looked at them and simply stated, “I am going to marry her”! Several months later, on September 10th 1894, Richard and Pauline were married in a small chapel next to a castle. After they were married, Pauline retired from performing, though not at Strauss’s request. They were actually known to perform concerts together, and Strauss would say “No other female voice sang my songs in such beautiful and touching way as she did”, unfortunately there are no recording of Pauline singing, so we have to take Strauss’s word for it. She is immortalized in his large output of songs and, of course, in the major roles he wrote for sopranos, and she was also known to make notes in his scores and give her opinion on his compositions. Strauss would say this about his wife, “She is very complex, a trifle perverse, a trifle coquettish, never the same, changing from minute to minute.” Pauline was not unaware of her quirks and had warned Richard, “You, yourself know best how many weaknesses I have, and everybody knows my moods. And now I am supposed to suddenly become the model housewife?” However, domestic life seemed to suit her, keeping the Strauss household running smoothly. She was a devoted wife, making sure Strauss was eating properly and getting daily exercise. After World War I, we can see a shift in Strauss and Hugo von Hofmannsthal’s approach to their female protagonist, who embraced the importance of family values, Die ägyptische Helena is a perfect example, as we see a husband and wife try to reconcile their marriage after a difficult ordeal. This is another example of how Pauline was always present in his work, her devotion to him and their son. “Strauss would never have become a great man without Pauline,” insisted the composer’s friend Manfred Mautner-Markhof. 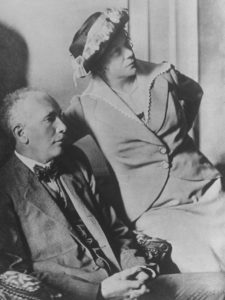 They had a very happy marriage, when Strauss’s work required him to travel and Pauline was unable to join him, he wrote her long love letters nearly every day. Like most healthy relationships, they were not without their quarrels, but there was never even the suggestion of infidelity from either of them. At the tender age of eighty, Pauline told a friend “I would still scratch the eyes out of any hussy who was after my Richard”. Come experience Richard Strauss’s Die ägyptische Helena for a spectacular one night only event.